Oxford University Press, USA, 9780199571994, 354pp. Bloody was once a shocking word. It was used largely by the working classes and caused their betters to shudder with horror. But Bloody isn't slang anymore in Britain, though it is still a swear-word. Everyone knows it, and most people use it, particularly when they're trying not to be offensive. 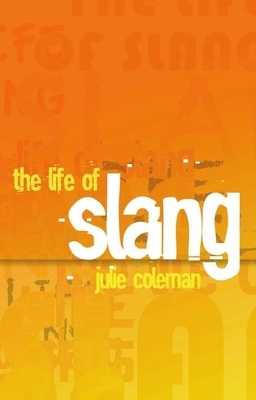 In The Life of Slang, Julie Coleman offers a fascinating portrait at an aspect of our language that is as slippery as it is lively--the ever-changing, protean world of slang. Ranging from Old English to the posts on Facebook and Twitter, Coleman shows why and how slang is used and how it has developed in English-speaking nations around the world. The records of court cases at London's Old Bailey and machine-searchable newspaper collections provide a wealth of new information about historical slang, while blogs and tweets provide us with a new perspective on contemporary slang. Coleman shows that slang can be quite difficult to pin down. Indeed, some words begin their life as slang, but then move on to the more dignified realm of standard English. Snide "insinuating, sneering" began as slang but is now considered standard use. Mortar-board "a hat worn at graduation" and tip "to give money in return for a service rendered" were both slang when they were first used. On the other hand, some words remain stubbornly slang. Pig has been slang for "police officers" since the beginning of the nineteenth century, and Buck "a dollar" has enjoyed slang status in the United States for a century and a half. Vividly written and packed with fascinating observations on an ever-changing aspect of our language, The Life of Slang will delight all word mavens and is guaranteed to teach you some new words that you shouldn't use in polite company. Julie Coleman is Professor of English Language at the University of Leicester.